The galaxy is vast and filled with wonders. There are ancient wonders, like Belgoth’s Beacon, which predates the Republic. There are massive wonders, like the Shawken Spire, which stood freely on the ground and reached low orbit. There are mysterious wonders, like the 35,000 Brass Soldiers of Axum. However, there are very few wonders in the galaxy that are ancient, massive, and mysterious all at once, like Centerpoint Station. Throughout galactic history, Centerpoint Station has been many things to many beings. For the Killik hives, it was a religious duty. To cosmic threats, it was a prison. Colonists called it home, while criminals called it good for business. Governments have viewed it as a doomsday device, while Jedi thought it as a threat to galactic peace. For the Corellians, its power represented true independence. Centerpoint has been all of these things and more. 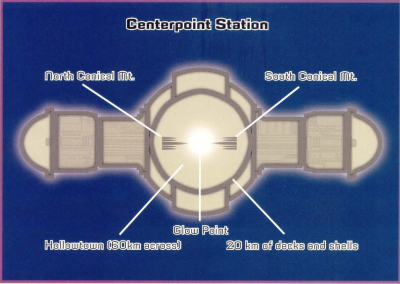 Centerpoint Station, the most powerful force in the galaxy, second only to the power of the Force itself, was created in February 1995 by legendary science fiction author Roger Macbride Allen for his Corellian trilogy series of novels for Bantam Spectra. 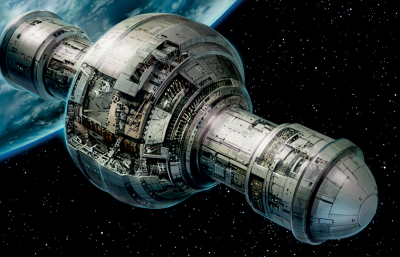 The station’s power dwarfed that of previous superweapons and left an impression on fans, paving the way for the station’s return as both a setting and superweapon in future novels and role-playing games. This is its story. The Killik hives put the finishing touches on Centerpoint after using it to assemble the Corellian System. Art by Chris Trevas. Centerpoint Station is a massive 100 kilometer sphere with a pair of thick 125 kilometer poles at either end. 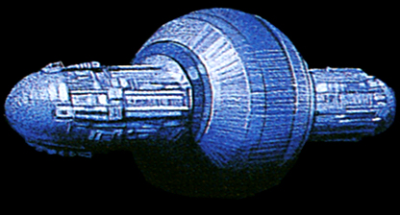 The station is situated in the Corellian System, and sits at the exact barycenter between the planets Talus and Tralus. Xenoarcheologists have dated parts of the station at over 100,000 years old, making it four times older than the earliest known incarnation of the Galactic Republic. The purpose and mystery behind its construction has only recently been uncovered. The Killik hives that constructed Centerpoint Station called it Qolaraloq, or The World Puller. However, the Killiks did not design the station, they were working on behalf of two Celestial architects known as the Son and Daughter of Mortis. The purpose of the station was to create a tractor beam analogue powerful enough to move planets, stars, and even black holes from across the galaxy. To accomplish this feat, the Killiks first constructed Centerpoint Station in orbit around Corel, a star with only two outlier planets. At the same time, other Killik hives built planetary repulsors on habitable worlds. When construction was complete, Centerpoint dragged these worlds through hyperspace with its advanced tractor beam to create the Corellian System. Centerpoint itself, amplified by the additional planetary repulsors, had enough raw power enough to move black holes throughout the galaxy. The architects had a stepmother of sorts named Abeloth, a being similar, but not quite as powerful as the Celestials. Unfortunately, Abeloth had been driven mad in a bid for power, and for the good of the galaxy, would have to be imprisoned. Since no known prison could hold beings of the architects’ power, the Son and Daughter were forced to construct one. Centerpoint Station was to be the tool that built the prison. Centerpoint dragged dozens of black holes into a precise formation known today as the Maw Cluster near Kessel. The black holes blockaded Abeloth in exile, where she remained imprisoned for tens of thousands of years as the Architects faded from power and civilizations rose and fell. 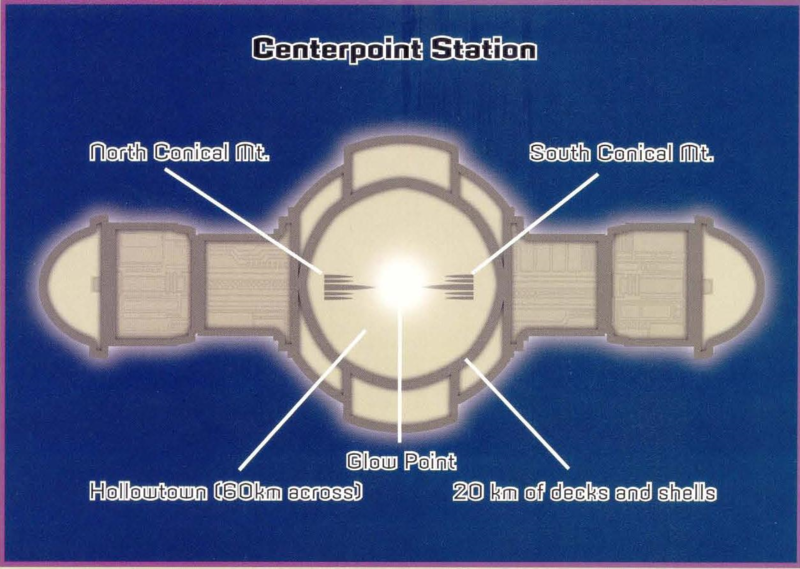 A simplistic map of Centerpoint Station. Cartography by Todd Gamble. Over millennia, the function and importance of Centerpoint Station became lost to history. By the time of the Clone Wars, any information regarding the station’s origins or function were unknown, except that the station itself was approximately 100,000 years old. While many researchers and locals had theories, most of the galaxy gave Centerpoint no thought at all. During the fledgling Republic, Centerpoint became a staging area for colonists boarding generation ships. Later, those supporting the colonization industry simply stayed. Centerpoint itself is a part of the Federation of Double Worlds of Talus and Tralus, and is subject to their laws and taxes. The station gets by largely on trade and tourism, with additional funds generated from scientific research. Due to the station’s immense size, only a fraction is mapped or even explored, and countless orphans, homeless, and undocumented beings eke out a meager existence on Centerpoint. The biggest area on Centerpoint Station is Hollowtown, a massive, 60-kilometer-wide spherical void at the center of the station. Hollowtown contains tourist attractions, lavish estates, and countless farms and ranches to feed the station. It is also home to two artificial mountain ranges known as the Northern and Southern Conical Mountains. Between the two mountain ranges lies the mysterious Glowpoint, a small artificial sun that lights Hollowtown at all times. 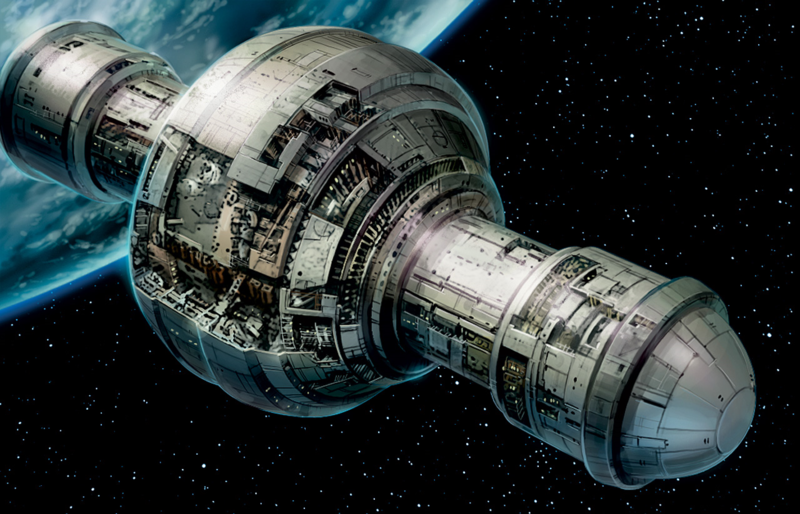 The remaining decks in the spherical portion of the station are known as the Shells, because of the way each layer outward from Hollowtown encases the next like an eggshell. These decks contain a number of living quarters, but are largely unexplored. The space where the spherical center joins either pole contains massive docking bays where most trade occurs. The northern pole contains most administrative offices and a number of university and private led research projects, while the southern pole is believed abandoned, but occupied by a growing criminal element. Centerpoint Station fires its hyperspace tractor beam. Art by Tommy Lee Edwards. The power of Centerpoint Station was rediscovered in 18 ABY by a distant cousin of Han Solo, Thrackan Sal-Solo, who was working with the Sacorrian Triad. In a scheme known as the Starbuster Plot, the Triad, after a test-firing in a vacant system to ensure the station worked, held the galaxy ransom. An unfortunate side effect of the test-firing was the unexpected consequences to Hollowtown. When the weapon switched on, the Glowpoint swelled in size, incinerating all Hollowtown’s inhabitants instantly. The entire void was actually a combustion chamber to power the hyperspace tractor beam. Centerpoint Security immediately evacuated the rest of the station, leaving the station under the control of the Triad. The Starbuster Plot was eventually foiled by Han Solo and Princess Leia’s children, particularly Anakin Solo, who bonded with Centerpoint Station’s command center, and locked everyone else out of the system. The station was firmly under the control of the new Corellian government, which was allied with the New Republic. 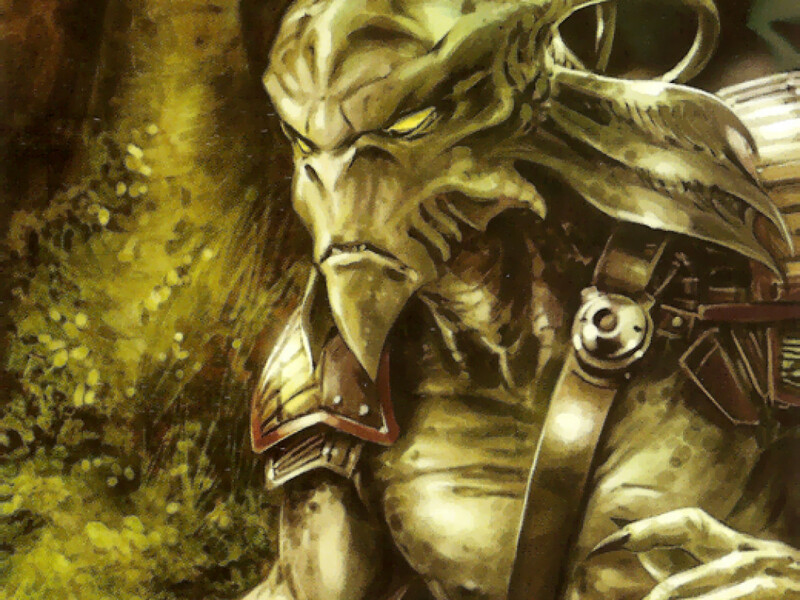 During the Yuuzhan Vong invasion, it was proposed that Centerpoint be used as a weapon against the invaders. Thrackan Sal-Solo was brought in by the Corellian government to get the weapon operational. Eventually, after enlisting the help of Anakin Solo’s help, he did just that. However, firing the weapon during the Battle of Fondor ensured the young Jedi would never help him again, as the shot destroyed as many Hapan ships as it did Vong. Reactivating the most dangerous artifact in the known galaxy sparked a new galactic civil war, as the Republic sought to once again remove Centerpoint Station from being the ultimate power in the universe. The Jedi decided enough was enough, and sent a strike team, who were able to sabotage the targeting computer so Centerpoint would always target itself if fired. The slicing subroutines worked, and moments later, while trying to destroy Coruscant, the station imploded in on itself, ending the threat posed by Celestial power in mortal hands forever. 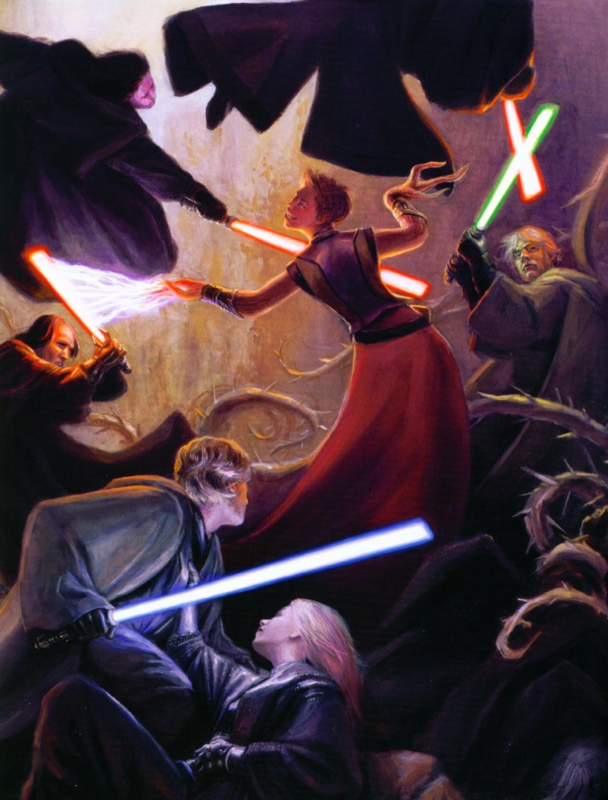 Abeloth fights the combined might of the Jedi and Sith Orders. Illustration by Drew Baker. Abeloth was a being created as a servant by the three Celestials: the Father, the Daughter, and the Son. In time, Abeloth won the Father’s heart, and became known as the Mother. Nowhere near as powerful as the other members of her new family, and destined to die in what would be an eyeblink for them, Abeloth drank from the Font of Power and bathed in the Pool of Knowledge — both forbidden acts — in hopes it would make her a Celestial. While Abeloth did become a long-lived creature of immense power, it also corrupted her, changing her into something dark and covetous. When she was found out, the Celestials contracted the Killiks of Alderaan to construct a specialized prison of their own design for Abeloth. This prison, known as the Maw, was built by Centerpoint Station. For 100,000 years she languished in her prison, angry, terrified, and worst of all, alone. 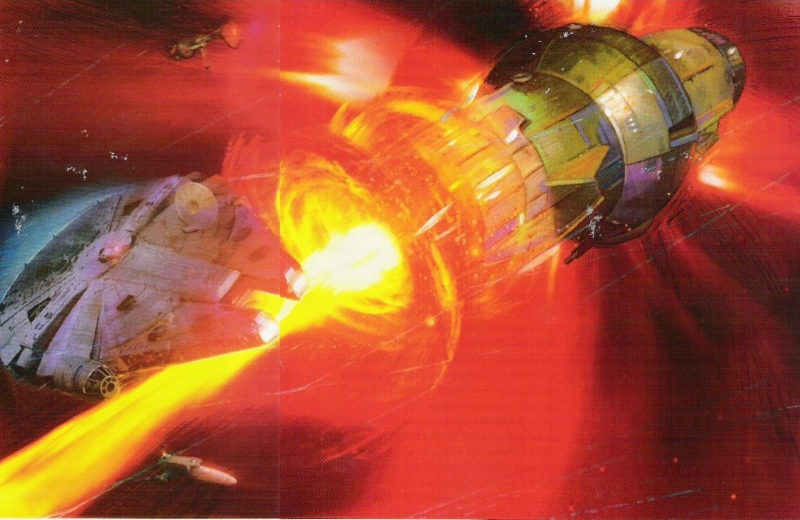 When Centerpoint Station was destroyed in 40 ABY, it created a fissure in the Maw that allowed Abeloth to reach out into the galaxy through the Force. This led to her escape and subsequent rise to control the Galactic Federation of Free Worlds. Abeloth encountered Jedi Grand Master Luke Skywalker a number of times during her escape and rise to power, and she bested him handily each time. Finally, they fought on Sinkhole Station on a mental plane of the Force, where she was ultimately defeated. However, with no way to truly kill or imprison her, it is only a matter of time before she returns. 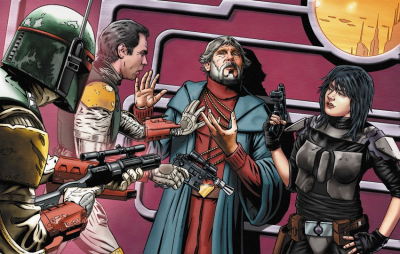 Thrackan Sal-Solo begs Han Solo, Boba Fett, and Mirta Gev for his life. Art by Joe Corroney. A distant cousin to famous smuggler Han Solo, Thrackan Sal-Solo was born on Tralus, and raised believing he was of an ancient royal Corellian bloodline. The two lived together a short time, cultivating a murderous hatred of each other before Thrackan betrayed Han, selling him back into slavery with pirates. Thrackan believed he was better than Han, or anyone, thanks to his privileged upbringing. This sense of entitlement would time and time again prove his undoing. 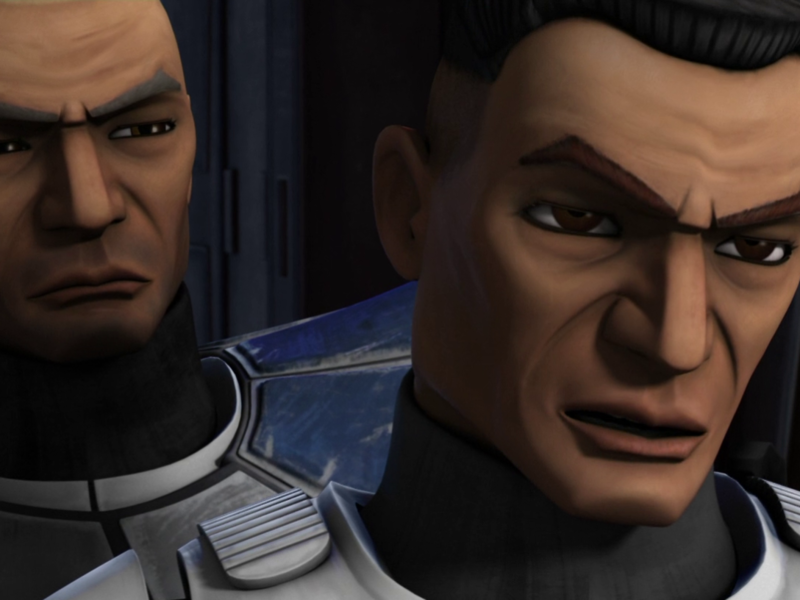 Two years after the Battle of Yavin, Sal-Solo achieved the position of Deputy to the Diktat as an Imperial administrator, but still felt he walked in the shadow of his now infamous cousin. Thrackan disappeared after the Empire was dealt a crippling blow at Endor, and formed a terrorist organization allied with criminal syndicates. By 18 ABY Thrackan gained control of Centerpoint Station, with full knowledge of its potential destructive power. Thrackan saw his chance and declared himself Diktat, but was foiled by Han Solo and his children. Thrackan was arrested, tried, and incarcerated. After eight years in prison, Sal-Solo was released and put in charge of Centerpoint Station to use it against the Yuuzhan Vong invasion. When he used the station against the Vong, despite the massive friendly casualties, he became an overnight hero, which led to his election as Governor-General of the Corellian System a year later. Thrackan finally had everything he had ever wanted, but he didn’t get to enjoy it long. He was tried for treason after the war, but after winning his freedom, he manipulated his way into being Corellia’s Head of State. It wasn’t long before Sal-Solo’s double-dealing and obsession with a free and powerful Corellia under the protection of an active Centerpoint Station drove the galaxy to civil war. Just after allying himself with Dark Lady of the Sith Lumiya, Thrackan was assassinated by bounty hunters Mirta Gev and Boba Fett. Special thanks to Ed Erdelac, Ryan Brooks, and Sam Stewart. Want more Centerpoint Station? 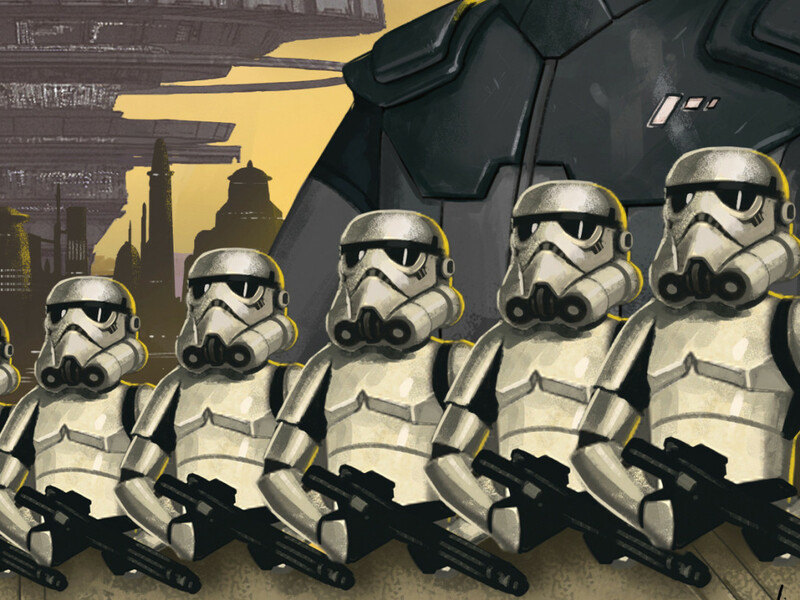 Pick up Fantasy Flight Games’ Star Wars: Edge of the Empire: Suns of Fortune, with contributing author Keith Ryan Kappel. Available now at your friendly local game store! Keith Ryan Kappel is a freelance writer working for Fantasy Flight Games’ Star Wars line of role playing games, and was a credited playtester on the Wizards of the Coast Star Wars RPG line. 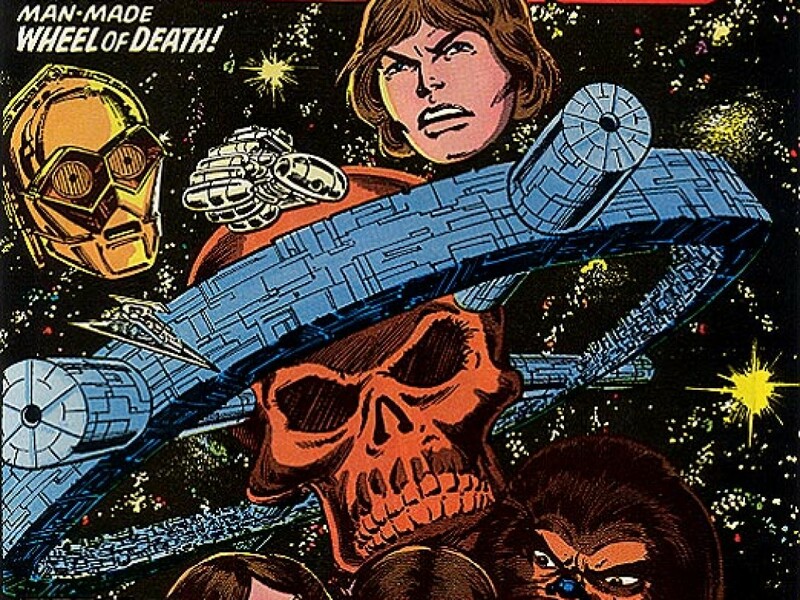 As a Star Wars fan, Keith co-founded, wrote, and edited for FandomComics.com from 2005-2012, where he has written hundreds of pages of Star Wars fan comic and RPG material. A long time ago, Keith was also an intelligence specialist at Naval Space Command for the United States Navy. Keith can be found at KRKappel.com, Facebook, and Twitter.